8th December, 2016 – The Islamic Corporation for the Development of the Private Sector (ICD), the private arm of Islamic Development Bank Group (IDBG), signed a Memorandum of Understanding (MoU) with AlHuda Center of Islamic Banking and Economics (CIBE), to implement “Biniog Sathi Banking Model”, which is a new initiative of ICD. “Biniog Sathi” – a Bangla word that means Friend in Investment, is a new generation banking model that incorporates the concept of Zakat and Charity with the existing banking model and offers a solution to the problem of credit default for both the beneficiaries and the banks. This model is based on Islamic Finance principles and it raises the competitiveness of Islamic Banking model to a new level of superiority. This model is a blessing for microfinance banks and micro beneficiaries. Under the cooperation framework, both parties are determined to collaborate in the implementation of the Model at the field level with the help of potential partners, in particular the Islamic microfinance organizations and have agreed to work together to implement the pilot phase of the model in different countries through various Islamic Microfinance Programmes. On this occasion, Mr. Khaled Al-Aboodi, stated: “The aim of the MoU is to expand the financial products and services offered to the private sector investors in common member countries. At this moment, the model is in theoretical stage and it needs pilot testing in the field level for its implementation. 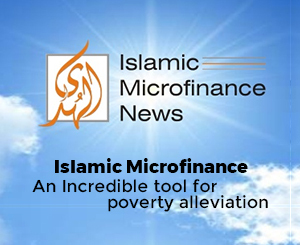 Once done it will nurture the Islamic finance industry with a new service”. Mr. Zubair Mughal, Chief Executive Officer, AlHuda CIBE, stated that, Islamic Microfinance is a recognized tool of financial inclusion, social development & poverty alleviation, and the “Biniog Sathi” is an eminent value addition in Islamic Microfinance arena which will connect Zakat and Charity models with Islamic Banking and Finance industry to achieve the optimum goal of poverty alleviation and economic development. He also appreciated the different ICD initiatives for the development of Islamic Banking and Finance industry around the globe.